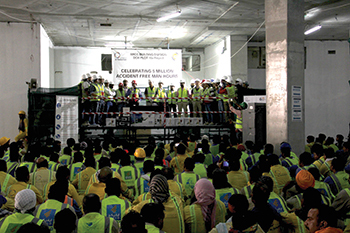 Al Naboodah celebrating five million man-hours without a lost-time accident at the Dubai Creek Harbour site. These contracts include construction of new emergency services buildings; roads and streetlight works, installation for utilities at a residential development besides construction of a new corporate headquarters for a leading airline, and four substations for Dubai Electricity and Water Authority (Dewa) to accommodate the growing demand from new developments. Three of the four substations are contracted to ANCG through Mitsubishi Electric Corporation and are located in the communities of Wadi Al Safa, Al Mamzar and Warsan in Dubai. The fourth substation will be delivered in partnership with Siemens and will service the Dubai South – Jebel Ali neighbourhood. According to ANCG , work on these substations was scheduled to begin last month (July) and will be completed early in 2020. The contracts follow ANCG’s successful completion of three substations contracted through Mitsubishi Electric Corporation, for the Federal Electricity and Water Authority in Ajman earlier this year, it states. The Emirati group says another contract was signed to execute infrastructure works in the greater Meydan area that entails the construction of roads, landscaping and the installation of utilities. The corporate HQ complex ANCG is constructing includes a 46,700-sq-m office building, utility buildings, car parks, boundary walls and infrastructure and is due for completion by the end of next year. Finally, ANCG will construct a dedicated fire station, ambulance station and police station in a developing precinct with contracts that include fit-out and MEP (mechanical, electrical and plumbing) works. Meanwhile, the company last month celebrated achieving five million man-hours without a lost-time accident at its landmark Dubai Creek Harbour site. ANCG is constructing two 37-storey towers with residential units, penthouses and commercial units, plus external works and landscaping at Creekside Plot 18-A within the 6-sq-km Dubai Creek Harbour development by Emaar Properties. “Projects of this type come with their own unique challenges due to working at extreme height and the need for getting heavy equipment on high levels,” says Moustafa Hassan, project director. “We have reached the 33rd level without any lost time accidents which is quite an achievement on a project of this scale and scope,” he adds. To date, a total of 70,000 cu m of concrete has been poured and 18,000 tonnes of steel used on the project, the company says. Structurally, 33 of the 37 floors are complete. The entire project is due for completion in mid-2019.